Allergic reactions can come at any time, at any age. Hives, those annoying little rashes, can feel like fire on the skin and can make you self-conscious if an attack happens in public. But what can you do to prevent an outbreak? Check out the three most common causes of hives to see if you might be making yourself prone to an outbreak. If you’ve recently started a new medication, it’s important to pay attention to how your body reacts. Rashes or welts are a common side effect of many prescription medications, especially if the dosage is increased quickly rather than over time. If you notice this, contact your doctor immediately to get a new prescription. If an insect bites or stings you, the results can be more than bothersome. One of the biggest causes of hives is an allergic reaction to a bug bite. Make sure to watch your step around ant hills and try to stay alert to prevent any bites, stings, or scratches. One of the most frustrating causes of hives can be developed at any age: sensitivity to certain foods. If you notice welts forming on you, but not on others that have shared the same meal, try to see if an allergic reaction might be the culprit. This can especially happen if the immune system is weakened or if there’s been a change in medication, so make sure to keep an eye on what’s going into your body and rule out one thing at a time until the cause is found. 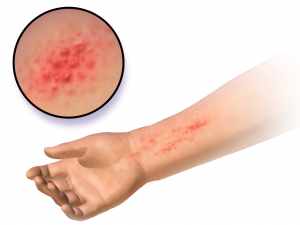 Mild rashes and welts can last 24 hours while the immune system works out the offending chemical, and treatment can usually be a mild antihistamine. If, however, you notice that the rash isn’t going away, or have trouble breathing, contact your doctor immediately as the allergic reaction could be more serious. Keep an eye on the size of the outbreak and try to narrow down the cause to prevent further outbreaks.